Fond of Snape » Blog Archive » Thursday Photo Day: So long, farewell, auf wiedersehen, goodbye! Thursday Photo Day: So long, farewell, auf wiedersehen, goodbye! Today my prompt over at Photo Thursday at Create a Connection is appropriate for my last time hosting in the month of August! This week, I’d like to see you post a picture of a “goodbye”, a fond “farewell” or even better, an enthusiastic “see you later”! This could be a wave, a sign, a kiss, running away from the camera, any one of many things! Have fun with this! Sailing away into the night, saying goodbye to the island we just visited! That’s a beautiful pic for goodbye!! I played too! I have a sunset pic too – nowhere near as good as this one though. Wow that is one glorious picture! Gorgeous, just gorgeous. That’s my kind of goodbye! I’ll come up with something for my goodbye and post it soon. This is so beautiful. I would buy a card with this on it. 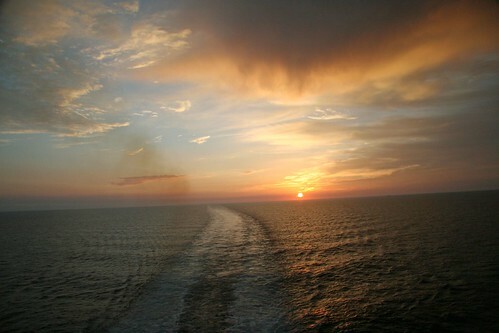 What a beautiful sunset, and I LOVE the trail in the water from the boat. Great photo! Great photo. I had a totally different take on your challenge. I enjoyed this though.